Virtual meetings have a really bad reputation. First of all, they're meetings. But seriously, we suffer through connection drops, time zone confusion, meeting at 3AM, and talking for hours with people we've never met and probably never will. Even if our virtual meetings are barely tolerable, they can still be maddeningly frustrating. This ebook is packed with insights for people who lead, attend, or charter virtual meetings. By analyzing what can go wrong using risk management principles, we can make our virtual meetings much more effective. Virtual teams are officially the way of things now, and virtual teams must have virtual meetings. But virtual meetings are different from face-to-face meetings. We can't run virtual meetings using the same techniques we use for face-to-face meetings. Why not? And what can we do about it? Even if your virtual meetings are barely tolerable, they can still be maddeningly frustrating. Would you like to just get your work done? 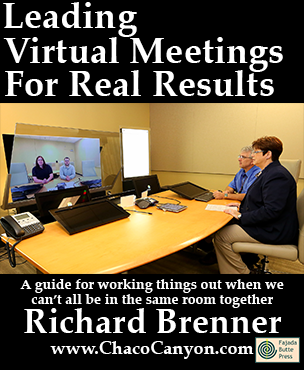 This ebook shows you hundreds of ways to make your virtual meetings better. No, really — Hundreds. And many of the things you can do to make your virtual meetings better cost nothing. Most of them don't even require approvals from anyone else. You can just do them. https://ChacoCanyon.comTm shows you how to explore the "risk space" of virtual meetings. By applying this method to a common class of virtual meetings — the virtual team meeting — readers see how to use this method and adapt it to their own particular needs. And it's organized by risk: Infrastructure Risk, User Equipment Risk, Human Behavior Risk, Presentation Risk, and so on. Within each chapter you'll find a collection of short tips, ranging from 100 to 500 words. Each tip is focused on one aspect of managing a risk: understanding what generates the risk, explaining what the risk looks like when it materializes, mitigating the risk, and dealing with unexpected manifestations of the risk once they've occurred. Unlike many business books, this one is designed as an ebook for the hyper-reader. That is, even though it reads well cover-to-cover, you don't need to read it that way. You can search for topics related to the challenges you face, and when a term or phrase is used that you want to see defined or explored further, you can click or tap that term and see the definition or explore that term further. And it's all packaged in a single, compact ebook. Load it onto your Acrobat-enabled mobile device or laptop and carry it with you on your next trip. This item is also available by the single copy (USD 14.99 per copy), in 10-copy packs (USD 11.50 per copy), in 50-copy packs (USD 10.60 per copy) and in 100-copy packs (USD 8.60 per copy). Leading Virtual Meetings, 500-pack is in Acrobat format, which gives you several advantages. You can print it, and read it like any book. Or in electronic form, you can use the search capability of Adobe Reader to find passages of special interest to you. If you load it onto your laptop, tablet, or other mobile device, you can read it anywhere — and it's weightless, too. 89 pages.